Lukas Marxt film is directed into the darkness of the landscape. What we see is a 30-minute static shot, in which silence spreads: an illuminated factory area on the horizon, otherwise just blackness, stretched flat and wide like a canvas. The cycle of the sun dictates the dramaturgy of the film. We experience a sunrise, and shortly after, the onset of a solar eclipse in real time, filmed over the Ranger uranium mine in Australia. While the image takes its time to illuminate, the viewer is thrown into a state of expected, condensed emptiness. In this double movement of becoming, the sunrise and the genesis of an image, nests the category of permanence. After some time, the red of the dawn can be distinguished on the horizon. The gaze is slowly released to a massive crater, carved in the earth, which, a few minutes later, slips back into the night. As the sun reveals the landscape, after a brief hesitation, the film stops. Double Dawn stretches its media reflection between elementary oppositions. Between the area submerged in darkness, and the light of the dawning sun; between reality and fiction. 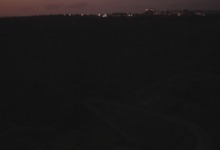 For in the image of the double sunrise, which is noted on the silent sediments of the radioactive elements, the narrative of post-apocalyptic staging is formed. The mine, as a wound beaten into the ground, conjures all too well the association with a meteorite or nuclear disaster. Only though the audio track is the viewer linked back to reality. You can hear the sounds of the surrounding area: crickets chirping, bird song, as well as Geiger counters and the steps of the filmmaker in the background. The result is a crystalline image, in which, the lucid relationship of real setting and fiction begins to shimmer. Marxt provokes the paradox of an unexcited awe in ignorant viewers – a confusing game between the concrete and undetermined. Subtle and patient, beyond the usual media excitement and with a passing gesture, this cosmic event is held, in an image that is directed into the depths of the earth rather than towards heaven. Sensual Realism and the sphere of the surreal collide in this spectacle of nature, as if it were anarchic magic.